There is an English Idiom which is not very common in these parts, ‘get our feet wet,’ which refers to a first time experience, especially one that involves taking a risk. I came to realise how Westerners seem to have this aversion to wet floors when I noticed the sprawling carpets in their toilets and bathrooms – something unimaginable in the East (we “love” our floors wet!) This may explain why we don’t often hear this expression. Nevertheless, a ‘truism’ conveyed by this expression finds universal resonance - it suggests that you have to experience something to truly know what it is like (except when it comes to vice!). It’s an invitation to ‘just jump in and do it’ – to get involved rather than to just stand at a distance like a disinterested and uninvolved observer. The trick is to jump into the pool if you really want to know how the water feels. A mere description would never suffice. Jesus’ scandalous and troubling action in washing the feet of his disciples did precisely this – it was an invitation to get their feet wet. He wish to impart a new standard of love – one that was not based on an individual’s capacity but rather Jesus’ love would now be the new benchmark for loving. No oral teaching or description would suffice to convey the point which Jesus wanted to make – he had to show it, he had to make himself an example for them. The cross would be his blackboard. Jesus’ initiative was also a stark reminder that there is no room for observers in His camp and anyone who wishes to follow Him must be prepared for a hands-on experience; they must be ready to get their hands dirty, their feet wet, and even take up not just the towel and the basin, but the cross in imitation of Jesus himself. And that is certainly what’s so worrying. It would be so much easier and safer to stand at a distance to observe, to analyse and to give feedback and suggestions. Everyone’s a natural critic. While hundreds sacrifice sleep and vacation and even risk their lives in the Search and Rescue Operations revolving around the missing flight MH 370, thousands of online analysts were making their own assessments and speculations from the anonymous safety of their armchairs in front of a television or a computer screen. But then comes the Paschal event, which our Triduum re-enacts each year, Jesus leads his disciples from the comfortable and safe environment of the Cenacle where the Last Supper was celebrated into the darkness of Gethsemane to experience that excruciating vigil in preparation for the events that would follow; Jesus takes them from a mere theological exposition of what the ritual of the Eucharistic meal and the feet washing signify to the horrifying reality of His own Passion and Death. He beckons not only his disciples but all of us who now commemorate this event to follow him as he makes his way through the valley of death into Jerusalem, into the stronghold of his enemies and accusers where he will be falsely accused, unjustly sentenced and horribly executed as the unblemished and innocent Lamb led to slaughter. One can choose to remain indifferent and distant as an observer at best, or one can choose the path of a true disciple who gets into the action, risk having our feet get wet and tread that path less travelled. I don’t know about you but I don’t like getting my feet wet. It’s nothing to do with the Western obsession of dry floors but rather phobic concern of leaving dirty footprints on the floor in the aftermath of my passage. It’s the safety of anonymity. But in the idiomatic sense of the expression, it’s about my fear of taking risks. It’s about my lack of courage. It’s about the trepidation of plummeting into a maelstrom of trouble that comes with the job description of a Christian. I’d much rather play it safe, be a crowd pleaser, confined myself to the sanitised celebration of the Eucharist with all the smells and bells than to go down on my knees and get my hands dirty with washing someone else’s feet. I don’t think you would also like the prospect of receiving communion from my hands thereafter. Doesn’t seem sanitary! I would rather have others take the first step or perhaps, let Jesus take the first step, since he’s the one that suggests that we should get our feet wet, right? But this is it! Jesus has taken the first step and he has set a blazing trail for us to follow. Jesus did not only tell us to ‘jump first!’ He took the first plunge. He divested himself of his divine splendour and glory and kneels down before us, he washes and dries our soiled feet, in order to make us fit to sit at table for God’s Wedding Feast. He could have easily said "Wash one another's feet" but he didn't. He did it. Isn't that really the message behind the entire Gospel? Jesus doesn't just say to do something, he does it, then says "Follow me". Jesus doesn't just say "No greater love is there than this, to lay down one's life for a friend" - He dies for us. He doesn't just say "Give the crowds something to eat", he blesses bread, multiplies them and feeds the crowds himself. Every word comes with an action. Every prayer, a ritual. To those who say the Catholic church shouldn't focus on the ritual so much as the words, I challenge you to find where Jesus did not back up his words with actions. Christianity is a lived reality, not just a sanitised hypothesis. The beginning of the gospel tells us that Jesus’ ‘hour’ had come. It is the hour of his departing and it is also the hour of the love that reaches to the end. It is the time to step out of the sidelines and to step across the safety of the police line. Jesus reveals to us what it really means to get our feet wet – it means loving to the end – stepping outside the limits of one’s closed individuality – breaking through into the divine. Pope Benedict, in the third book of his trilogy on Jesus of Nazareth, tells us that the ‘hour’ of Jesus is the hour of the great stepping beyond, the hour of transformation, and the hour of a metamorphosis that can only be undertaken by agape – love that reaches to the end. And so each disciple must choose and decide to embrace his ‘hour’ too, the hour that calls for the totality of self-giving, of remoulding of being, of loving till the end, even if that end means unto death. 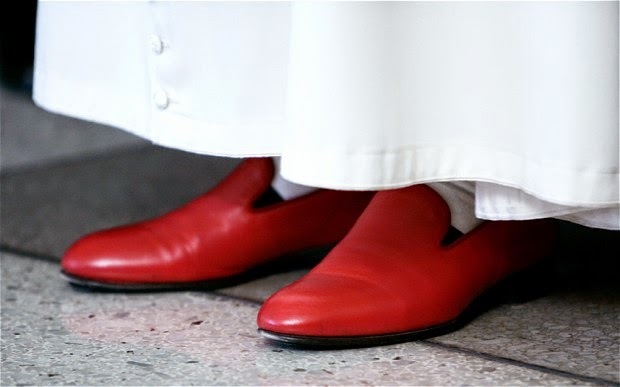 All this ultimately reminds me of that frequently mocked practice of Pope Benedict, which is actually an ancient papal tradition, of wearing red shoes or red slippers? Why does the Pope wear red shoes and what has that to do with our present celebration? First, it is not a fashion statement. Second, it is not Prada as some uncharitable critics would claim. Throughout Church history, the colour red has been deliberately chosen to represent the blood of Catholic martyrs spilt through the centuries following in the footsteps of Christ. The red papal shoes are also linked to Christ’s own bloodied feet as he was prodded, whipped, and pushed along the Via Dolorosa on his way to his crucifixion, culminating in the piercing of his hands and feet on the cross. The red shoes also symbolises the submission of the Pope to the ultimate authority of Jesus Christ. Beyond this, it is said the red papal shoes also signify God’s burning love for humanity. Finally, when the Pope bows his head in prayer to the Almighty and looks down upon the redness of his shoes, he is reminded of his duty as a pastor, a shepherd, to lay down his own life for his sheep. Therefore, the challenge isn’t just getting our feet wet – it’s getting it covered in red. Today, we remain in the safe and sanitised haven of the Upper Room. Tomorrow, we step into the bloody execution ground of Calvary. Let’s plunge in and get our feet wet!